The Sketchnote Workbook, the follow-up to Mike Rohde’s popular The Sketchnote Handbook, shows you how to take the basic sketchnoting skills you learned in the Handbook and use them in new and fun ways. You think you have fun taking sketchnotes in meetings? Try using them to record your travels. Or start a food journal. Or break out those visual notetaking skills in your next brainstorming session—whether you're at work or school, or just trying to figure out how to organize the paper that’s due next week. The Sketchnote Workbook comes with a 2+ hour companion video that brings the ideas you read about in the book to life. Mike takes you on the road with him to various locations to show you first-hand how to use sketchnotes to generate ideas, document processes, map out projects, learn new languages, create visual to-do lists, and capture the everyday experiences that mean the most to you—whether it’s a trip, a meal, or an episode of your favorite TV show. Don't worry. You don't need to know how to draw to use the book or the video. Mike gives you a quick recap of how to use five simple shapes and basic lettering techniques to create visual notes that you'll want to share with your friends. 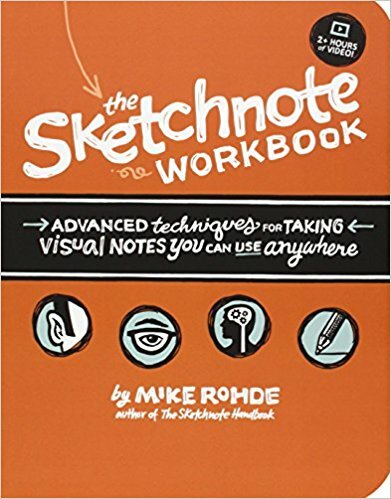 For those of you who have already mastered the basics in The Sketchnote Handbook, Mike includes advanced drawing and lettering techniques and offers pages within the book and downloadable worksheets that you can use to practice your new skills.